Claim your free spins now! Visit website for full T&C's. If you fancy going on an alpine adventure with a burly woodcutter then look no further than Lumberjack Pots, a tree-mendous progressive slot game set in a beautiful forest with views of the lake. Spin the reels and see where they land as the muscly lumberjacks get to work chopping down those trees. So why not take a look at our Lumberjack Pots slot review and soon you could be shouting TIMBER as you win a massive earth-shattering prize. This game is currently available to play on the fantastic casino site Dr Slots, a site that features all of the latest titles and releases from some of the industry’s most innovative developers. There are always top prizes and fabulous promotions to take advantage of so while you are over playing Lumberjack Pots Slot then why not take advantage of them? The standard card value symbols 9, 10, J, Q, K and A. Bets start from as little as £0.02 and go up to a betting maximum of £20 per spins which you can control from the total bet box. If you are an eager beaver then you can get that axe swinging more quickly by using the Autoplay function which you can customise from the log of wood at the bottom of the screen. You can use this option for a set amount of credit as well so or if you land a win above your pre-chosen amount then it will automatically stop. Alternatively, you can set it back to manual at any time. The game also features a tree-riffic soundtrack which you can control from the sound menu at the top of the screen. Lumberjack Pots Slots is an easy game to get to grips with and is an excellent starting point for players new to the world of slots. However, if you are more a seasoned pro then you will still find this game highly entertaining and well worth some of your time. Once you have decided the amount you want to bet with then it’s just a case of hitting that large ‘spin’ button next to the lumberjack and watching those reels spin. The reels will stop and start randomly and paylines run from left to right. Each win is subject to a multiplier of your original bets and the symbols that are going to bring you the biggest returns are the Mountie, boosting your win by 300x and the bear increasing 100x. The Wild Symbol is particularly exciting as when you see it on the reel it means you have scored a win. The chainsaw Wild can take the place of any symbol on the reels except for the mini-game symbols and Free Spins but is definitely one to watch out for. There are a couple of mini-games called the Chain Saw Prize and Lucky Logs that offer the additional opportunities to win boosted bonuses – just watch out for the naughty gofer! This game has an RTP of 94.52% so you can expect to play the long game rather than picking up a big win quickly. It also has a progressive jackpot which is activated by 5 ‘jackpot’ symbols appearing on an active line. It is available on any bet and once it is won, it will automatically be reset. 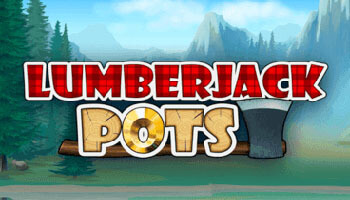 Lumberjack Pots is a fantastically entertaining slot game and one which has a great theme and a friendly user-interface and is one that we would through recommend.